President Jonathan Insists On Democratic Principles: Governance Must Be Based On Democratic Principles! President Goodluck Jonathan has said that governance must be fundamentally based on democratic principles and committed service to the people. 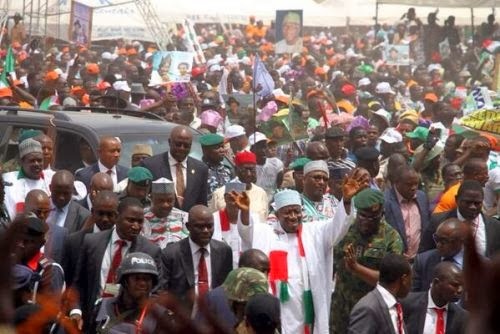 The President stated this tuesday when he addressed the Peoples Democratic Party (PDP) supporters in Ilorin, the Kwara State capital, where some members of the All Progressives Congress (APC) and those of the Allied Congress Party of Nigeria (ACPN) defected to PDP. Jonathan, who was accompanied by Vice-President Namadi Sambo; National Chairman of PDP, Alhaji Ahmed Adamu Muazu; and the Chairman of the Board of Trustee of PDP, Chief Tony Anenih; said that governance devoid of the principles of democracy would simply not do the citizens any good. He said his visit to Kwara State signaled an end to the complaint of the people that they did not have any say on issues that concerned them. According to him, the visit would free the people of the state from the dictatorial past where leaders were imposed on them. The President said: “The people of Kwara State are now free and they are no longer tied to the wish of an overlord.” Jonathan claimed that some PDP chieftains who dumped the party recently for the All Progressives Congress (APC) left because their aspirations were at variance with the expectations of the people.